ART OF TRANSIT: A Metro local bus on Broadway passes the entrances to Grand Park in downtown L.A. Click above to see larger; looks better larger! Photo by Steve Hymon/Metro. The Times kicks the tires of the ExpressLanes project and looks at the preliminary data released last month for the project on the 110 freeway. The gist of it: speeds are up in the ExpressLanes, down in the general lanes and some motorists are happy and others are very not happy. Transportation experts continue to back the project, saying it’s the best way to potentially add capacity to the freeway and it will take time for the public to get used to the lanes. The city of L.A. is considering switching its car-share vendor to Hertz from the current Zipcar. The issue is there are very few Zipcars in L.A. — just 40 (yikes! ), mostly around UCLA and USC — and Hertz is seemingly offering the city a better deal by paying for exclusive parking spots and revenue sharing. My three cents: too bad it has to be one car share firm over another; it would be great if consumers had a choice. Semi-related: As we posted recently, there are now four Zipcars available for rental at Los Angeles Union Station. More info here. What was missing here and in other city policy discussions was an examination of what these train lines would do for—and to—the city. In the Valley, there is talk of converting the popular Orange Line express bus to light rail, better able to handle the growing patronage. A Crenshaw rail line will be built and light rail is changing East L.A. 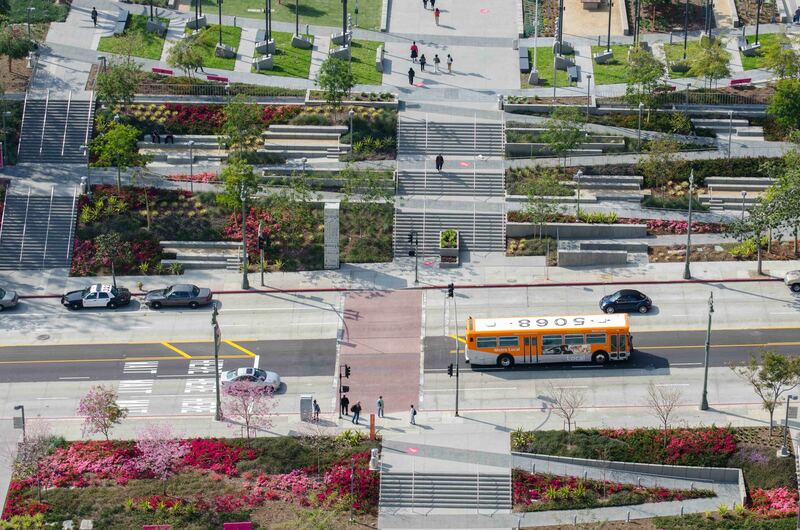 The subway extension will remake the neighborhoods in the Wilshire corridor. It’s definitely something for Greuel and Garcetti to discuss. But the subject deals too much with Los Angeles’ future to attract attention in a campaign where both candidates are worried about a short-term gain of votes in an election less than two months away. Yet on the whole, those I introduce to our subway emerge impressed. Say what you will about their limited reach; the Red and Purple Lines surely must rank among the cleanest, most comfortable, least urine-smelling systems in America. You may lose twenty minutes waiting on platforms, but you’ll have taken a subway — in Los Angeles! Some transit observers regard this town as a child who, having broken a leg on the playground, started school only after a considerable delay: perhaps he hasn’t caught up with his peers yet, but you should’ve seen how far behind he was a year ago. This sense of Los Angeles in the remedial class intersects with the notion, correct or not, that transportation just works differently here: differently when we didn’t have a subway, and a different kind of subway now that we have one. Read the whole thing. Colin makes some very cogent points about the region and its attitudes toward transportation and, more specifically, the changing attitudes of some younger residents toward the concept of automobile ownership. The funny-but-sad tournament is trying to determine which American city did the best job of turning its downtown area into a giant parking lot, i.e. a parking crater, to serve whatever buildings were allowed to remain. Check out the photos of Tulsa, which appears to have leveled a big chunk of its downtown since the 1970s to accommodate more cars. Geesh. If you’re just turning in, L.A. surprisingly got bounced in the tourney’s first round by Dallas. Speaking of L.A.-Dallas….that was a sour third period last night, Kings. Once at the optometrist’s office, the receptionist kept giving me parking instructions after I tried to convince her I walked. It was like speaking another language. A lot of (older) people do that. I’m surprised Detroit didn’t make the parking crater bracket. At least 50% of the downtown area is surface parking lots. How many infrequent carpoolers are the cause of the slow-down in the general lanes because they refuse to pay the “minimum usage monthly maintenance fee” BS for FasTrak. Get rid of the maintenance fee and the problems will go away. What’s taking so long for useless studies to get this thing done? It has been over four months since that and nothing has been discussed at the board meetings about this. The maintenance fee is unanimously hated by many motorists. It’s not something that voters in LA had a voice in either. It has just to go. If our elected officials who are paid with our tax dollars mind you, don’t have the balls to get something done, they should be kicked out of office! I have always thought …. the heavier the general lanes traffic, the lower the toll should be, in order to encourage solo drivers to use the toll lanes …. why are the Expresslanes doing the exact opposite? What surprised me about the LA Times article on the HOT lanes, was the statement that Metro would have to return $210 million to the Federal government if the HOT lanes don’t meet their goals after a year. This is the first time I have heard this. If true, it would Metro should have said from the beginning, “We’re going to gamble $210 million that this project.” If the statement is not true, then Metro needs to respond aggressively. If the statement is true, then it’s another example of Metro being untruthful with the real costs of this project, as has been the case of TAP and locking gates. If I did things like this at my job, I would be fired. Steve, might you be able to get any insight as to whatever happened to Yaroslavsky’s motion? Those car-poolers among us who are now tying up the regular lanes (yes, I’m one of them) would be very interested to know. Thanks. I’ll try to find out what happened.